The Dandan/Matar alley tells a story of people’s resilience, of enduring precarity, and resistance to multidimensional forces of forced population displacement that threaten most low-income groups in today’s Beirut. Our overall assessment is that the two meters wide alleyway plays a critical social role in the city: It provides a block of affordable housing in a city increasingly prey to speculative investments, and in a neighborhood in close proximity to employment opportunities in the construction and cleaning sectors. Here, dwellers were able to build a communal spirit and collaborative relations that bring them together as a community. Yet, the dwellers of the Dandan/Matar alley, like many others in the city, are threatened by urban renewal and forced displacement. After the “reconstruction” of Beirut downtown within the framework of the real-estate company Solidere, Bashoura became a strategic location. Immediately outside the historical core, hence evading Solidere’s stringent regulations and speculative decisions, the area fell prey to big contracting companies and developers who saw it as the “new spots” to build high-rise buildings (Krijnen 2016). The biggest development in the area, the Beirut Digital District, extends over several lots and has a vision to expand beyond. Conversely, the number of low-income residents who have settled here during and after the war have been threatened with eviction. Whether tenants or property owners, many had to sell or leave their homes. With much absentee ownership, some of the remaining houses became attractive units for low-income workers who joined the war population in the neighborhood, typically renting one or several rooms, sometimes only a bed. relate to its surrounding environment. The narrow, one way street is accessible from Khandak al- Ghamik’s main street. It is reachable only by foot and ends abruptly with a wall. Aside from the two buildings marking the entrance of the alley on the main street, the alley’s ground floor is entirely residential. The thirteen buildings surrounding the alley are all low-rises (1-2 floors), built in the 1940s and 1950s. They are typically dilapidated, with almost half in need of severe repair, and a third in fine condition (37%). A few of the buildings have important heritage value for their architectural significance. Our survey indicates that 51 residential units are currently occupied. The main form of tenure is rental (70%), but a good 20% are owner occupied and 10 % are abandoned. These apartments house a wide diversity of individuals, with multiple nationalities, income groups, and religious belonging. The majority (75%) is Lebanese, the rest are Sudanese, Ethiopians, Bangladeshi, and Syrian. number of apartments is occupied the original property owners that came before the civil war. In recent years, 36% of the available apartments had been rented by new tenant from different nationalities. Although the apartments are in terrible condition, rent is very high. Thus, the mean rent of a single room appended with a small kitchen and bathroom is renting at USD250$. Current zoning and building regulations make the area particularly attractive for urban renewal. Consequently, property owners in this neighborhood have received in recent years attractive offers to sell their properties. Urban transformations have nonetheless been halted by several factors, including: (1) Complex property ownership patterns where multiple shareholders make it harder for a developer to purchase the lots, (2) the inaccessibility of the alleyway that makes it less attractive for development, and (3) the presence of 18 households benefiting from the protection of the old rent control, demanding consequently indemnities. ￼￼￼￼7 and building regulations that allow more intensive building in these properties, (2) rent control that places a cap on possible profit from rent for 18 housing units, and (3) the neglectful practices of property owners have considerably deteriorated the building stock. We begin with the proposition that cities are enlivened and enriched by the mixity of their dwellers, a mixity that should be reflected in the urban infrastructures that support a common living. In that contexts, alleyways such as the Matar Alley present excellent opportunities for Beirut to cultivate urban quarters that celebrate its social diversity. To this end, however, interventions for affordable housing cannot be divorced from interventions on green/shared spaces and economic and social opportunities that can support the residential fabric of the area. To support this vision, we propose to introduce a three-tiered intervention that (1) enhances and improves the affordability of housing while, in parallel (2) setting in place an “urban catalyst” that serves as training/entrepreneurship generation/employment generator/social coordinator for the dwellers, and (3) a green/public space upgrading strategy to connect and improve the shared spaces of the area. 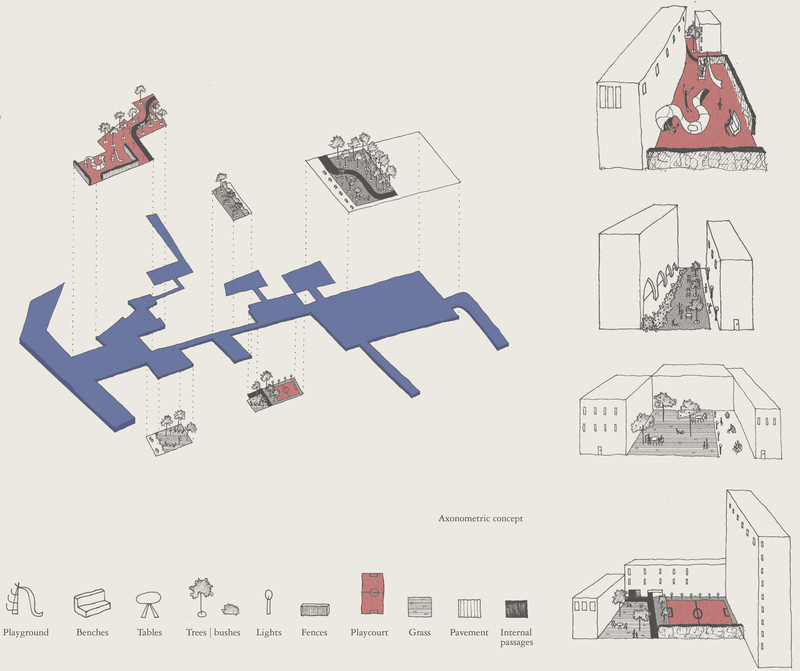 The general proposal is consequently to set in place an “urban process”, one that counters the ongoing deterioration of spaces of affordability in Beirut by producing a reverse trend, one that anchors dwellers in place, strengthens their hold over the neighborhoods where they live and improves their livability. Our proposal is to insert an “urban catalyst”: a space that acts as a strong anchor to strengthen the presence of current neighborhood dwellers in place and empower their relationship with other dwellers in Bashoura and nearby neighborhoods. The urban catalyst has a crucial role in the affordable housing strategy itself: it is part of the plan that will make financially sustainable the implementation of Matar alley’s affordable housing units, where implementations like this grab the interest of limited profit developers such as BDD, due to its continuous process. Urban catalyst and affordable housing are therefore in a tight reciprocal relation. Non- compartmentalized thinking has been necessary: in order to try to solve alley’s critical if not dramatic issues, we had to think out of the alley. Henceforth, our strategy is conceived as a process that moves exponentially between the stages, whereby each stage opens the door to the next. But the purpose is not only creating jobs for unemployed people: the intention is to go further and try to encourage people themselves to participate in the process of fixing and renovating their houses. So, the catalyst will include workshops focused on teaching and improving technical skills (e.g. plumbing, electricity, construction...), and a wit lab that will build an interdependent relationship between technology and traditional practices. This can be accomplished by a partnership between BDD and Nawaya network, where by taking different actions, both can produce one outcome. Hence, by conserving the social mixity of the alley, the Urban catalyst inserted in the two empty lots (1198-1187), will ensure economic sustainability whereby what we insert in these lots is going to be very critical to the success of the conservation project in all. In relation to heritage buildings, we propose an urban conservation scheme where the urban fabric is conceived as an urban heritage cluster to be conserved. Thus, we propose a typological reconfiguration of existing building, re-subdividing current buildings to provide new units of affordable housing. Practically, meeting the economic demands for affordable housing can create one entity of affordability. The first challenge as well as the basic guideline is to reconfigure the buildings without compromising the character of the actual traditional typologies. To address its current state, the cluster needs to be reconnected to the city by increasing its porosity with the new net of public and semi-public spaces and thus into a sustainable and dynamic pocket of affordable housing while also, introducing new units of affordable housing. dividing them after extracting the 25% legal rights to generate the public and semi-public spaces in the alley, the minor interventions of re – adapting use and the urban catalyst (legal text annexed p.13-14). Beirut Digital District (BDD) could finance the urban catalyst project, as a strategy to diversify its investment in the neighborhood and attracting larger strata of society. And for the construction other developers and NGOs, like the “The Nawaya Network”, can donate and help. As a limited-profit developer, ZRE, the development company behind BDD, will develop the proposed housing units. The reconfiguration and rearrangement of old typologies in the alley will be financed by current residents through their income generated by initiatives in the urban catalyst. The addition of new units is going to be minimal: our aim is to respect the scale of the alley and to add affordable units. After pooling all lots, 25% of the lot area will be allocated for public uses. These spaces will increase the porosity and improve the livability of the alley. Inspired by the interventions of the Urban Think Tank in Caracas as well as those of the Municipality of Barcelona in the city, we have imagined a Bashoura Wit lab, a work-space model that adapts the Fab lab model, mixing high tech expertise with low tech – traditional expertise. In this model, a carpenter can potentially find high tech tools and shared technical knowledge to learn how to build his own model with contemporary work tools (a small-scale bridge between the technology hub of BDD and the handcraft tradition that has qualified all the neighborhood of Bashoura in the past decades). The main concept behind the wit lab is that any startup project can find a way to be executed through basic consilience and shared information and means. BDD could benefit from copyright percentages of the final products and renting the work space to users. This usually works through the amount of spent hours, prices according a user’s income, allowing consequently cross-subsidization. Double is the intent that has moved our thinking in shaping a new affordable plan for Matar alley. On one hand, we have the landlords and the pocket of already affordable housing due to the old rental law with frozen prices, represented by old tenants. So our main intervention is to restore and split the heritage typologies into smaller units that will be in a good and sustainable state in affordable rental prices. The most urgent question in this case is buildings’ condition. On the other hand, there are the new tenants that have not only to live in bad or terrible conditions, but even to pay an exaggerated rental price. This allows reducing the general costs of the intervention also. With the subdivision, there will be 88 units from the initial 42 ones. As for buildings’ physical state, the variety of the buildings in the alley has brought to a diversified intervention strategy itself, in which every building receives a personalized treatment but based on systematized, recurrent types of intervention. Almost every building will be restored and re – adapted to better life standards, taking into consideration people’s requests and ideas.